Sharon Long is here to tell us about Julia Heaberlin's third book, Black-Eyed Susans. Twenty years ago, Tessa Cartwright survived being buried alive with the bones of dead girls in a field of flowers. Black-eyed Susans. Now she's thirty-six and is watching closely as the man convicted of committing this crime goes through the final month before his execution. But she is not sure he is guilty. With about a month left until the execution, she decides to work with an attorney as well as a forensic anthropologist to overturn the verdict. The allure of the case is too much for the media who start hounding Tessa because she is the only surviving "Black-Eyed Susan." Then she finds newly planted Black-eyed Susan's planted near her window. Tessa is frightened more for the safety of her teenage daughter than she is for herself. The story winds in between this Texas town in the past and present, and next we follow Susan back to 1995, Tessa was a 16-year-old runner who always runs the same route every day. She would always throw a Snickers candy bar to the homeless man as she ran by. Her mother died was she was eight and she and her father lived in the strange house her grandfather built. One day Tessa is missing and when she is eventually found, she has amnesia and is temporarily blind. She meets with a psychiatrist who encourages her to draw to work through the trauma and regain her sight. Throughout the ordeal and the trial, Lydia her best friend is always there to support her. I was instantly hooked because I like Tessa how to find out who had done this awful thing. There are several twists and turns which I absolutely loved. I enjoyed this book so much that I am going now read her first two books. Julia is currently working on her fourth thriller which I will definitely be adding to, my to be read pile. The author considers this a novel of suspense. I agree but would say it more of a psychological thriller. I was intrigued to read this book as several of my friends had recommended it. 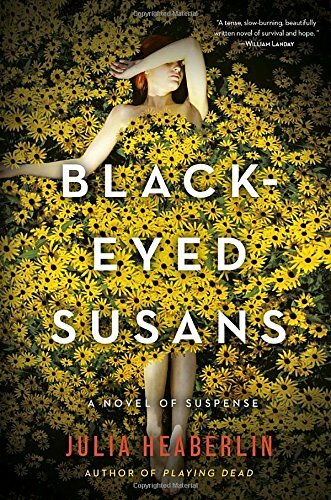 Black-Eyed Susans was an Amazon and GoodReads Best Book of the month for August as well as a UK top 20 Bestseller. Mystery Playground is on twitter @mysterplaygrnd or find us on Facebook. Wow! This book sounds absolutely enthralling, thank you for sharing! I LOVE the cover!